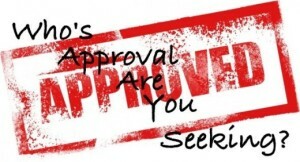 Whose approval are you seeking? Other’s or God’s? So often we are making decisions and behaving in ways that others would approve of but not God. Singles, does God approve of the person that you are dating/courting? Have you asked Him and waited for response? If you are married, you have already made your choice. Since your selection has already been made, I am not going to ask you, “Does God approve? However, the question that I want you to ask your self is, “Does God approve of the way that I treat my spouse?” Parents, “Does God approve of the way that you treat your children? I know that none of us are perfect, but the number one goal of every Christian should be to live in such a way that God approves. This is very important because Galatians 1:10 (Life Application Bible) says, “Am I now trying to win the approval of men, or of God? Or am I trying to please men? If I were still trying to please men, I would not be a servant of Christ. “ So as we live our lives, make our decisions and go from day to day, the question that we should ask ourselves is, “Would God be pleased? Would God approve of my decisions/actions?” If the answer is not yes than we should make a change. We all have to ask God to forgive us for decisions and behaviors that did not meet His approval. Lord please forgive us! Trust me, if God doesn’t want it for you, you don’t want it. It may feel good, sound good and even look good for the moment but you will pay later. Be brave and seek God’s approval in every move you make and every decision. Pray and ask God what He thinks about the matter. Aim to please God. If necessary, seek godly counsel and then be obedient to the counsel. Some times we seek godly counsel and then turn around and do it our own way. Remember that God’s way always lines up with the Word of God. If the decision or behavior is contrary to the word of God, it will not meet God’s approval. The decision that God wants you to make will bring glory and honor to Him! Make God’s approval a priority in your life. Consult with Him about everything! Thank you for this blog! Confirming my meditation in the past week. Pleasing the King (God)… results in blessing/pleasing His people! Agape.